Arnold Palmer brought a country club sport to the masses with a hard-charging style, charisma and a commoner's touch. At ease with both presidents and the golfing public, and on a first-name basis with both, "The King" died Sunday in Pittsburgh. He was 87. Alastair Johnson, CEO of Arnold Palmer Enterprises, confirmed that Palmer died Sunday afternoon of complications from heart problems. Johnson said Palmer was admitted to the hospital Thursday for some cardiovascular work and weakened over the last few days. Palmer ranked among the most important figures in golf history, and it went well beyond his seven major championships and 62 PGA Tour wins. His good looks, devilish grin and go-for-broke manner made the elite sport appealing to one and all. And it helped that he arrived about the same time as television moved into most households, a perfect fit that sent golf to unprecedented popularity. "If it wasn't for Arnold, golf wouldn't be as popular as it is now," Tiger Woods said in 2004 when Palmer played in his last Masters. "He's the one who basically brought it to the forefront on TV. If it wasn't for him and his excitement, his flair, the way he played, golf probably would not have had that type of excitement. "And that's why he's the king." Beyond his golf, Palmer was a pioneer in sports marketing, paving the way for scores of other athletes to reap in millions from endorsements. Some four decades after his last PGA Tour win, he ranked among the highest-earners in golf. "Thanks Arnold for your friendship, counsel and a lot of laughs," Woods tweeted Sunday night. "Your philanthropy and humility are part of your legend. 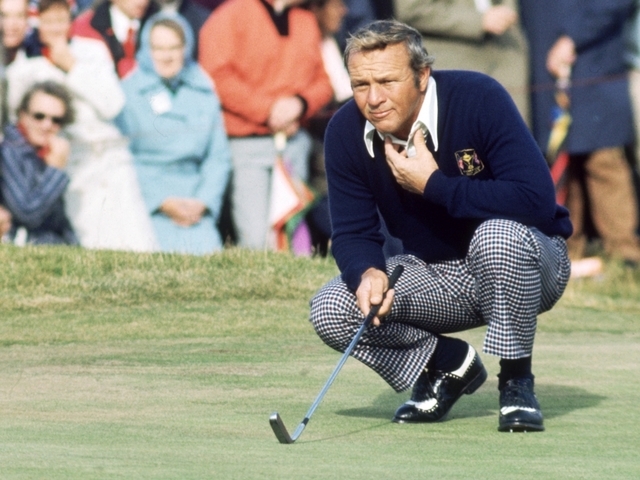 It's hard to imagine golf without you or anyone more important to the game than the King." On the golf course, Palmer was an icon not for how often he won, but the way he did it. He would hitch up his pants, drop a cigarette and attack the flags. With powerful hands wrapped around the golf club, Palmer would slash at the ball with all of his might, then twist that muscular neck and squint to see where it went. "When he hits the ball, the earth shakes," Gene Littler once said. Palmer rallied from seven shots behind to win a U.S. Open. He blew a seven-shot lead on the back nine to lose a U.S. Open. "I'm pleased that I was able to do what I did from a golfing standpoint," Palmer said in 2008, two years after he played in his last official tournament. "I would like to think that I left them more than just that." He left behind a gallery known as "Arnie's Army," which began at Augusta National with a small group of soldiers from nearby Fort Hood, and grew to include a legion of fans from every corner of the globe. Palmer stopped playing the Masters in 2004 and hit the ceremonial tee shot every year until 2016, when age began to take a toll and he struggled with his balance. It was Palmer who gave golf the modern version of the Grand Slam — winning all four professional majors in one year. He came up with the idea after winning the Masters and U.S. Open in 1960. Palmer was runner-up at the British Open, later calling it one of the biggest disappointments of his career. But his appearance alone invigorated the British Open, which Americans had been ignoring for years. Palmer never won the PGA Championship, one major short of capturing a career Grand Slam. But then, standard he set went beyond trophies. It was the way he treated people, looking everyone in the eye with a smile and a wink. He signed every autograph, making sure it was legible. He made every fan feel like an old friend. Palmer never like being referred to as "The King," but the name stuck. "It was back in the early '60s. I was playing pretty good, winning a lot of tournaments, and someone gave a speech and referred to me as 'The King,'" Palmer said in a November 2011 interview with The Associated Press. "I don't bask in it. I don't relish it. I tried for a long time to stop that and," he said, pausing to shrug, "there was no point." Palmer played at least one PGA Tour event every season for 52 consecutive years, ending with the 2004 Masters. He spearheaded the growth of the 50-and-older Champions Tour, winning 10 times and drawing some of the biggest crowds. He was equally successful off with golf course design, a wine collection, and apparel that included his famous logo of an umbrella. He bought the Bay Hill Club & Lodge upon making his winter home in Orlando, Florida, and in 2007 the PGA Tour changed the name of the tournament to the Arnold Palmer Invitational. The combination of iced tea and lemonade is known as an "Arnold Palmer." Padraig Harrington recalls eating in an Italian restaurant in Miami when he heard a customer order one. "Think about it," Harrington said. "You don't go up there and order a 'Tiger Woods' at the bar. You can go up there and order an 'Arnold Palmer' in this country and the barman — he was a young man — knew what the drink was. That's in a league of your own." Palmer was born Sept. 10, 1929 in Latrobe, Pennsylvania, the oldest of four children. His father, Deacon, became the greenskeeper at Latrobe Country Club in 1921 and the club pro in 1933. He had two loves as a boy — strapping on his holster with toy guns to play "Cowboys and Indians," and playing golf. It was on the golf course that Palmer grew to become so strong, with barrel arms and hands of iron. "When I was 6 years old, my father put me on a steel-wheeled tractor," he recalled in a 2011 interview with the AP. "I had to stand up to turn the wheel. That's one thing made me strong. The other thing was I pushed mowers. In those days, there were no motors on anything except the tractor. The mowers to cut greens with, you pushed. "And it was this," he said, patting his arms, "that made it go." Palmer joined the PGA Tour in 1955 and won the Canadian Open for the first of his 62 titles. He went on to win four green jackets at Augusta National, along with the British Open in 1961 and 1962 and the U.S. Open in 1960, perhaps the most memorable of his seven majors. Nothing defined Palmer like that 1960 U.S. Open at Cherry Hills. He was seven shots behind going into the final round when he ran into Bob Drum, a Pittsburgh sports writer. Palmer asked if he could still win by shooting 65, which would give him a four-day total of 280. Drum told him that 280 "won't do you a damn bit of good." Incensed, Palmer headed to the first tee and drove the green on the par-4 opening hole to make birdie. He birdied the next three holes, shot 65 and outlasted Ben Hogan and 20-year-old amateur Jack Nicklaus. Palmer went head-to-head with Nicklaus two years later in a U.S. Open, the start of one of golf's most famous rivalries. It was one-sided. Nicklaus went on to win 18 majors and was regarded as golf's greatest champion. Palmer won two more majors after that loss, and his last PGA Tour win came in 1973 at the Bob Hope Classic. Tom Callahan once described the difference between Nicklaus and Palmer this way: It's as though God said to Nicklaus, "You will have skills like no other," then whispered to Palmer, "But they will love you more." "I think he brought a lot more to the game than his game," Nicklaus said in 2009. "What I mean by that is, there's no question about his record and his ability to play the game. He was very, very good at that. But he obviously brought a lot more. He brought the hitch of his pants, the flair that he brought to the game, the fans that he brought into the game." Palmer combined power with charm, reckless abandon with graceful elegance. Golf no longer was a country club game for old men who were out of shape. He was a man's man, and he brought that spirit to the sport. It made him a beloved figure, and brought riches long after he stopped competing. That started with a handshake agreement with IMG founder Mark McCormack to represent Palmer in contract negotiations. Palmer's image was everywhere, from motor oil to ketchup to financial services companies. Even as late as 2011, nearly 40 years after his last PGA Tour win, Palmer was No. 3 on Golf Digest's list of top earners at $36 million a year. He trailed only Woods and Phil Mickelson. Palmer's other love was aviation. He piloted his first aircraft in 1956, and 10 years later had a license to fly jets that now are the standard mode of transportation for so many top players, even though the majority of them are merely passengers. Palmer flew planes the way he played golf. He set a record in 1976 when he circumnavigated the globe in 57 hours, 25 minutes and 42 seconds in a Lear 36. He continued flying his Cessna Citation 10 until he failed to renew his license at age 81, just short of 20,000 hours in the cockpit. Through it all, he touched more people than he could possibly remember, though he sure tried. When asked about the fans he attracted at Augusta National, Palmer once said, "Hell, I know most of them by name." Only four other players won more PGA Tour events than Palmer — Sam Snead, Nicklaus and Woods. Palmer's first wife, Winning, died in 1999. They had two daughters, and grandson Sam Saunders plays on the PGA Tour. Palmer married Kathleen (Kit) Gawthrop in 2005. Palmer was diagnosed with prostate cancer in 1997, which was caught early. He returned to golf a few months later, winking at fans as he waded through the gallery, always a smile and a signature for them. "I'm not interested in being a hero," Palmer said, implying that too much was made about his return from cancer. "I just want to play some golf." That, perhaps, is his true epitaph. Palmer lived to play.